You want me to do what, now? I try. I try very hard, in fact. But the truth is, I am not a very patient person. Oh I can do it when I need to. I can "act as if" in a bunch of situations. But dam$t don't waste my time. And it has nothing to do with not smoking. Okay, maybe it does just a little bit. I'm giving away a ton of stuff as I downsize to an apartment, going from over 2,000 square feet to less than half that. I post the items one at a time on Facebook, and I'm happy to give to anyone who needs it. This includes furniture that's only a couple years old. I just won't have room, and I find selling things a huge hassle. Anything I can't give away in this manner will eventually end up at a charity agency. This woman wanted an item for a refugee family, indicating a sense of urgency about it. Great! Perfect! Come get it! Contact me using Facebook Messenger. But no, she did not honor my request. 21 back and forth comments on the post. She had no plan. She was vague about who was coming to my home to pick it up. She wouldn't nail down a time. Kept giving me someone else's phone number to call. I'm not doing sh$t for you, honey. If you want this so badly YOU do the work. Okay, maybe in a past life I'd have had a bottle of wine, a pack of smokes, and been more chill about this thing. Maybe. We'll never know because I will not let a crazy person make me go there. I unfriended her and let my sister-in-law (who was patiently waiting to see if anyone else wanted it) come get it. Which she arranged promptly, because she is a not an insane person. Moral of the story: Someone else's needs should NEVER cause you harm. Good for you Annette and YAY for Smokefree living and YAY for your sister in law promptly getting on the ball. 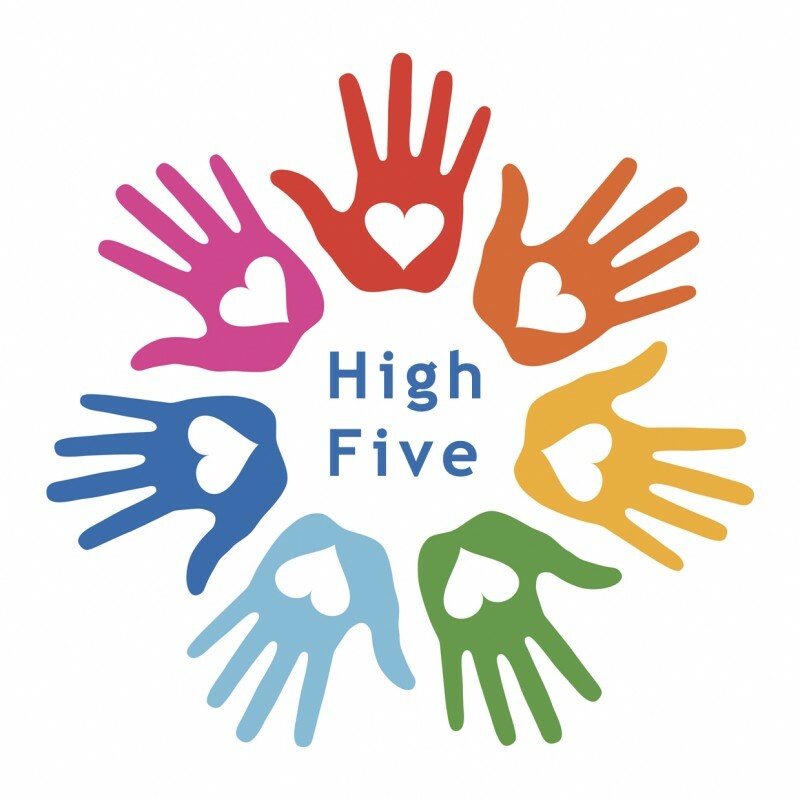 Thanks for the high five! I like getting rid of stuff, but I hate how tired I'm getting! But you WON! You didn't smoke (or drink) over it! I am always stunned by people and their expectations. I would do just about anything for anyone...within reason but man there are some real winners out there. When my husband did antique shows and people would try to get the price down, I would be very cooperative and utilize my sense of humor as much as I possibly could but sometimes people were downright insulting. One day, I sort of lost it and I asked the woman if she would like us to pay HER to take the item and then carry it to her car. Apparently, she got the message because looked very embarrassed and then left the booth. At closing time, she came back, apologized, and paid the full price for the item which was not yet sold. I have gotten some things on Facebook, have never tried to give anything away but I really SHOULD. Between our yard and our basement, someone could walk away really happy. Unfortunately, it is not all mine, in fact, very little of it is mine. You are doing an incredibly brave thing with downsizing AND helping others. I am proud of you. I find your story very validating, thank you! I think you've been pretty patient to exchange so many comments on the subject!!! And all is well when it ends well: at least your furniture will stay in the family! Congrats on handling the way you did, and not smoking over it, great job Annette! Daniela-3-11-2016 I LOVE this shirt! Hahaha I want that shirt! I see you as very patient and best of all you did it Smoke FREE! Great Job! Learning new ways to keep our boundaries firmly within our comfort zone is just one more reward of the Quit Journey! Congratulations! Next time you'll pull the plug that much faster! You're awesome, thank you for that. 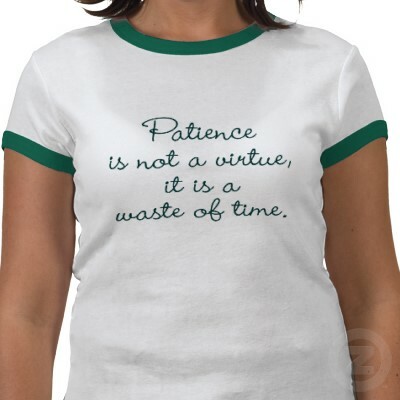 Question: Do women have a concept of patience that means something like ever-giving even at the cost of suffering? I see patience as giving my definition of a fair chance. No more. I think so Thomas, we are "programmed" to be mothers, so I think patience is in the code. Even as wives, once again we exercise our "right" to be patient, and I give it to you there, this one is a 2 way street. 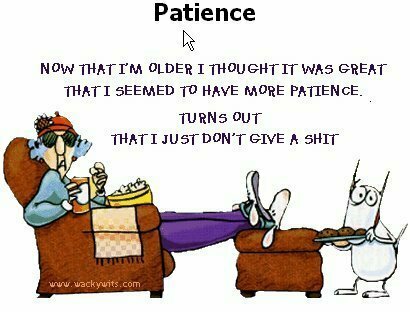 But if later in life we are watching over our elderly parents, here is another opportunity for us to prove our patience. And I don't want to be sexist, but I believe there are more daughters taking care of their parents than there are sons. We say in Romanian if you have a girl, when she gets married, you gain a son; if you have a son, when he gets married, others are gaining your son. Oh Annette you are such a good person. You have been going through a lot and I admire your strength. What really broke my back was falling down the stairs trying to give away my free Sh*t.
How dare you make them wait at the bottom of the stairs. I think I would have been very frustrated with that person too Annette. Good job your sister got the stuff instead! I never got to the hair-pulling stage, lol! I cut her off after one day. Sometimes patience is mistaken for procrastination or chronic indecisiveness. Neither really a virtue. I would have unfriended too--- inconsiderate to waste your time. At least you didn't smoke to mull over her countless replies! POOR PLANNING ON YOUR PART DOES NOT CONSTITUTE AN EMERGENCY ON MY PART! You mean those 21 back and forths were all just on ONE DAY???? Was there any part of the day left after that?!! I had to turn my phone off to sleep!